T.S. Poetry Press, 9780984553167, 166pp. 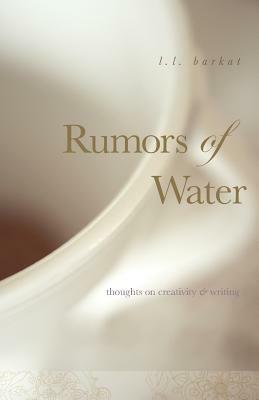 An Annie Dillard-style writing book that follows the writer's life as much as her philosophy about creativity and writing. Aspiring and accomplished writers will find a place to breathe, in both the memoir-stories and tips that seamlessly address major aspects of creative life-from inspiration to individual voice; from helpful habits, networking and publishing, to reasons we create and write. Says the first chapter, "There are so many things standing in my way this morning, I can hardly begin. Yet I've heard there are rumors of water. Maybe that is enough." And apparently it is. --- named a Best Book of 2011, Englewood Review of Books and Hearts & Minds Books. L.L. Barkat is a books, parenting, and education contributor for The Huffington Post blog and is the Managing Editor of Tweetspeak Poetry, where writers and poets can find everything from basic inspiration to full-fledged writing workshops. The author of eight books, including fiction, non-fiction, poetry, and children's learn-to-read titles, Barkat understands the writing process from all angles and gently, skillfully mentors both up-and-coming and established writers.